Gov. Phil Scott, R-Vermont, issued an executive order Thursday creating a 21-person climate action commission. The move came weeks after President Donald Trump announced the United States would be withdrawing from the Paris climate agreement, which had set aggressive goals to address climate change, including the reduction of greenhouse gas emissions. 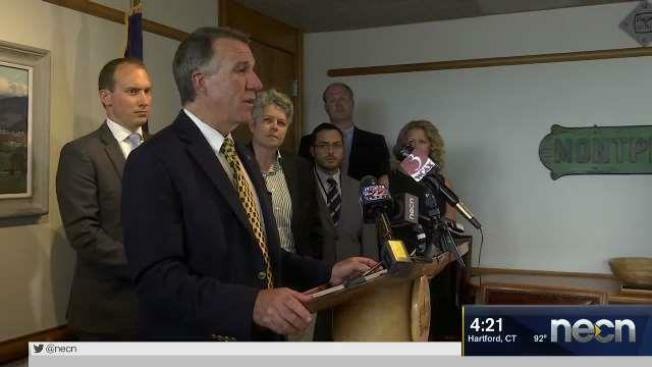 “Despite what's going on in Washington, I am committed to doing our part,” Scott said in announcing the climate action commission. The commission, made up of business leaders, transportation experts, members of the agriculture and forestry sectors, utility representatives, and others, will advise Gov. Scott on a long-term plan to slash greenhouse gas emissions and embrace renewable energy. Scott reaffirmed Vermont’s 2016 commitment to reduce greenhouse gas emissions by 80-95 percent below 1990 levels by the year 2050. He said the state also wants to meet 90 percent of its energy needs through renewable sources by 2050. “The question we have to answer today is whether we're going to let the impacts of a changing climate threaten our people and our economy, or are we going to harness the innovative minds of Vermonters to lead the growing climate change economy?” Gov. Scott said at the announcement. Scott said he wants the commission to give him three tangible suggestions by the end of the year—ways Vermont’s legislature can start thinking about attacking climate change while improving the economy. Some environmentalists told necn they hope to see bold recommendations from the commission, including recognition of the importance of renewable energy. Scott said however the state tackles this urgent challenge, it must provide solutions for all Vermonters—including the most vulnerable. The governor said no individual group should be unduly burdened. Scott added that programs developed to reduce greenhouse gas emissions must spark business growth and allow Vermonters to save money while reducing their carbon impact.